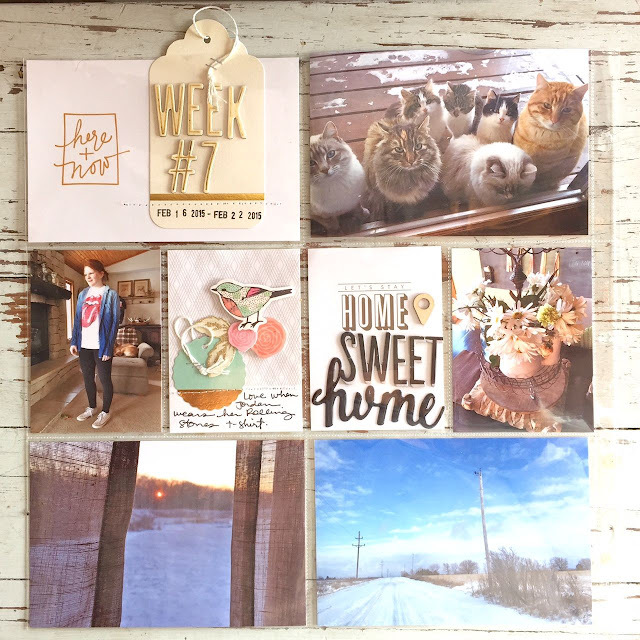 Today I'm sharing Week 7 of my 2015 Project Life. 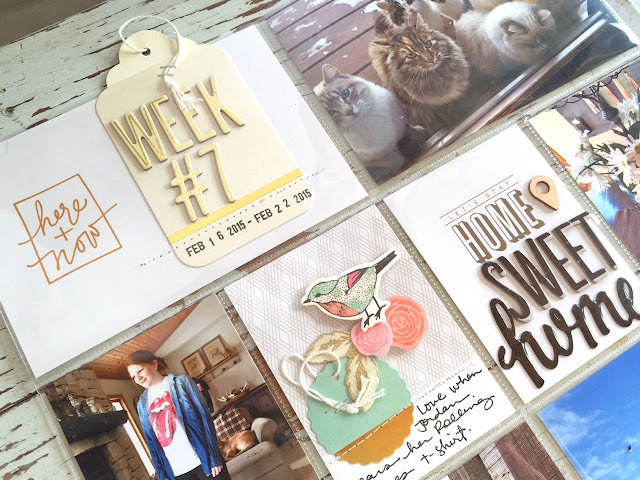 I used One Little Bird journaling cards that I downloaded and printed here at home. I love Peppermint's designs so much. 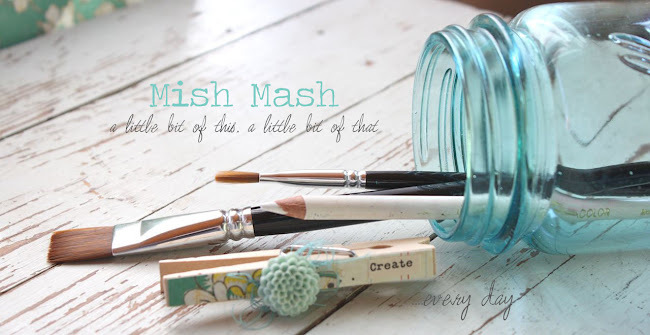 Clean and simple and so easy to use. Here's the two page spread. The left page. 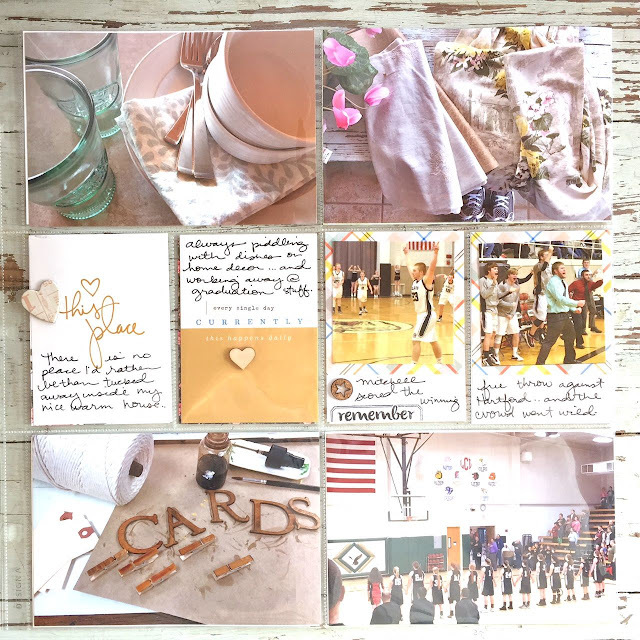 Simple photos and a few embellished journaling cards. The right page. I added more photos and journaling cards with hand written journaling. For the main, dated 4 x 6 insert, I added chipboard letters to a tag. I love how the One Little Bird kits coordinate so well and are designed so simply. 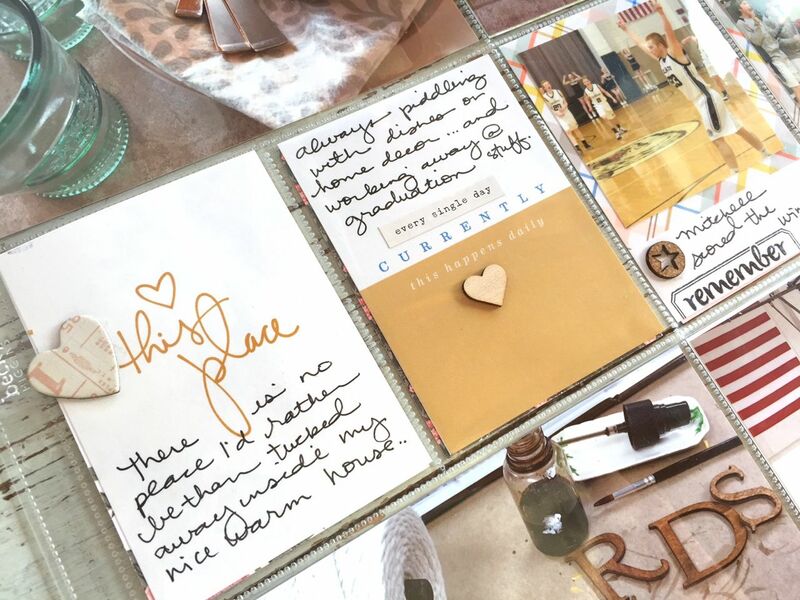 That leaves lots of room for embellishments and journaling. Or I can leave the inserts unadorned if I want a cleaner look. Slow but sure.....more pages to fill my album. 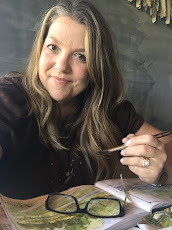 This Summer I have a made a bucket list of projects I'd like to make. 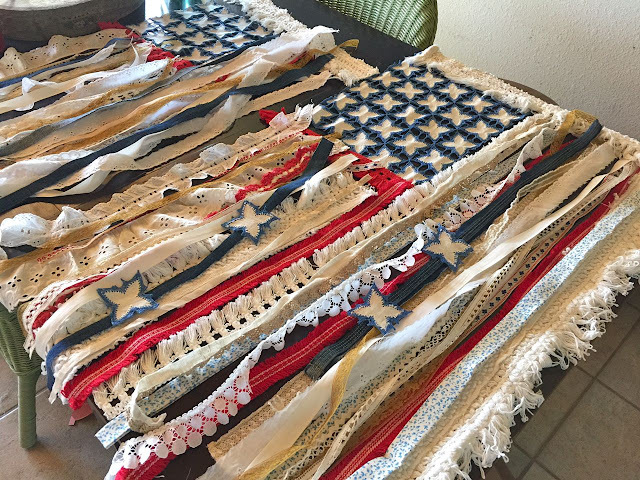 I saw some flags on Pinterest and Instagram and they soon made it to the top of my list. My daughter's birthday is July 4th so it's always a big celebration around our house. 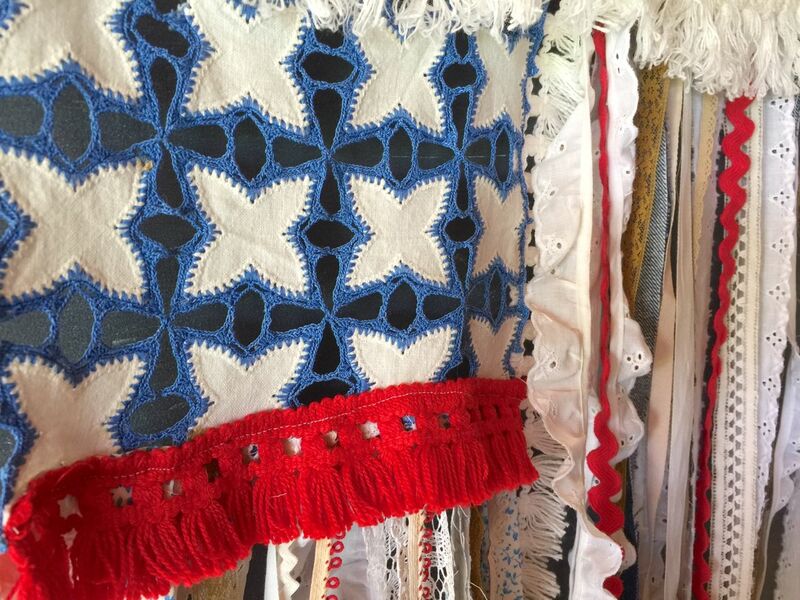 I started by collecting lots of vintage trims, ribbons and old table runners. That blue piece was perfect for my stars. 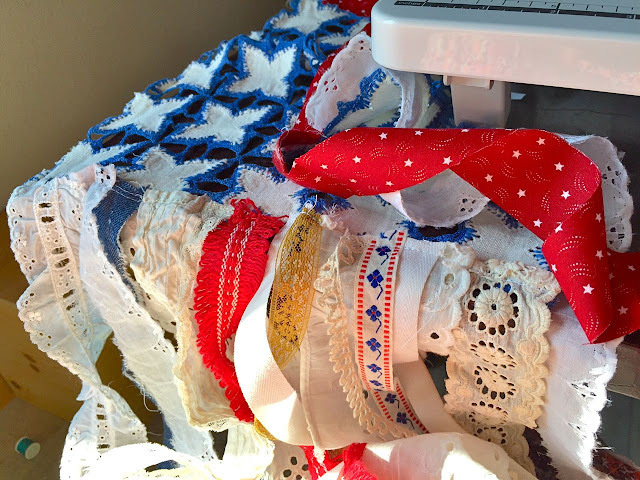 I laid out my design and started trimming yards and yards of vintage trims. I stitched them all into place and just kept on creating since I had extra vintage materials on hand. I went with a bohemian vintage look and kept everything look pretty rustic and raw. Jordan helped me cut some limbs from the timber behind our house. 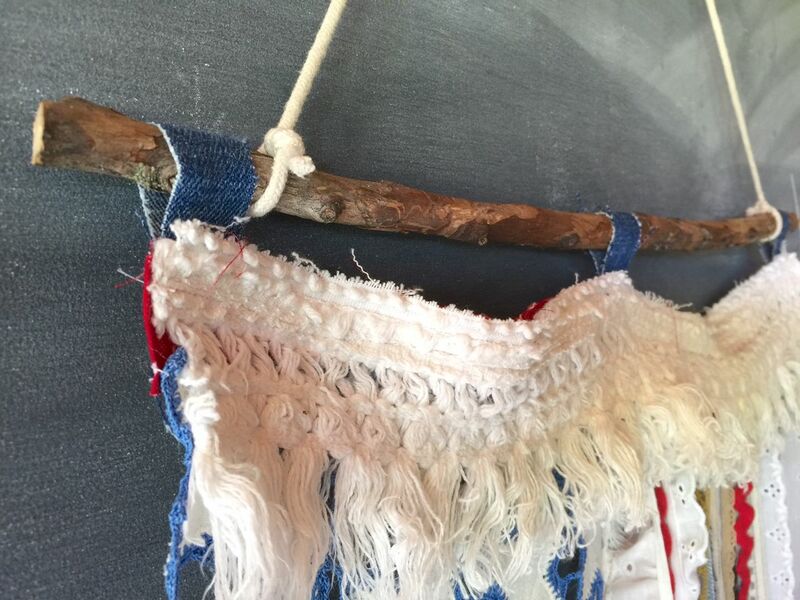 We got many a mosquito bite while collecting these limbs that we used to hang our flags. 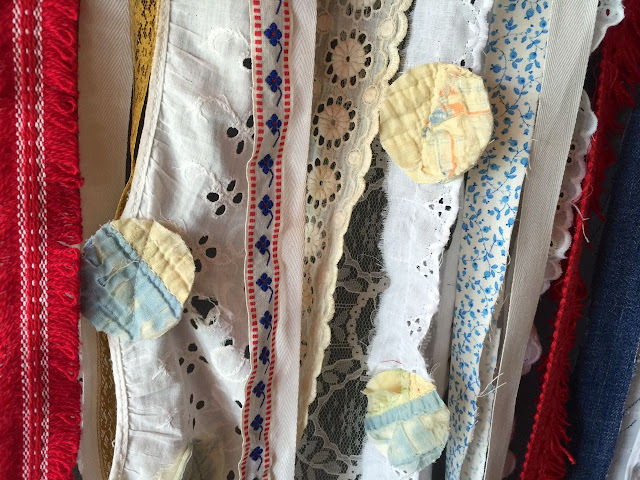 I added some details like these circles of old quilts I had in my stash. 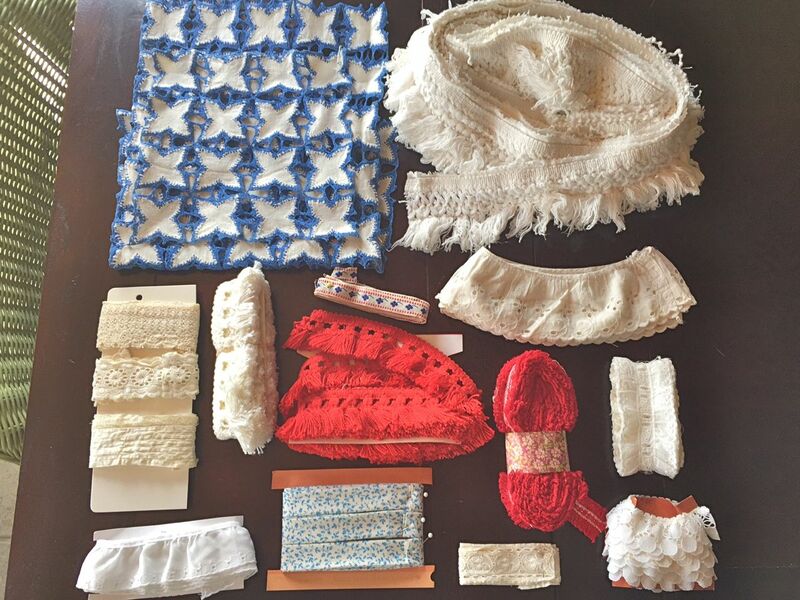 Reds, whites and blues....including old trims from chenille quilts, binding strips, old faded jeans and ric rac. Crocheted blue stars steal the show if you ask me. We ended up with some pretty cool creations I call Freedom Flags. 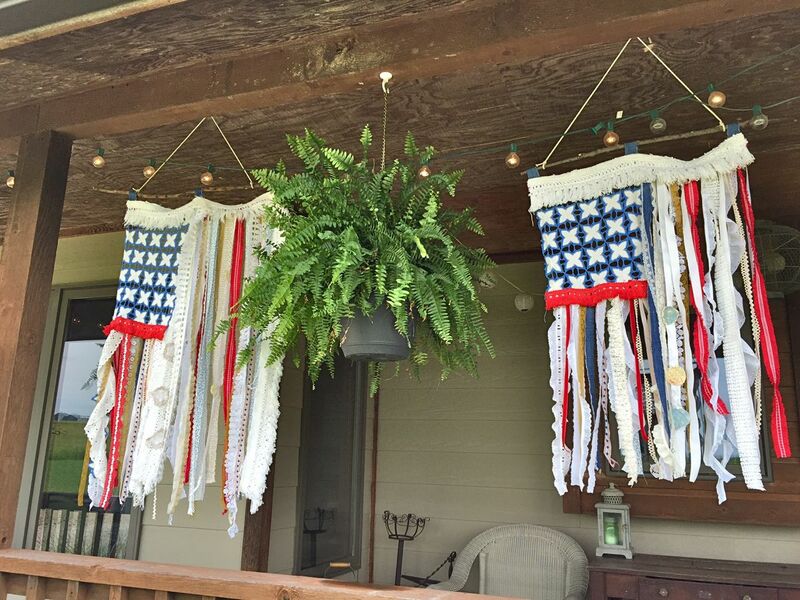 So perfect for showing your patriotic side and just in time for the July 4th celebrations. Here are two of them hanging from my porch, complete with hanging ferns and party lights. They look so pretty swaying in the breeze. I kept a few for myself and there's a couple left in my shop right HERE. 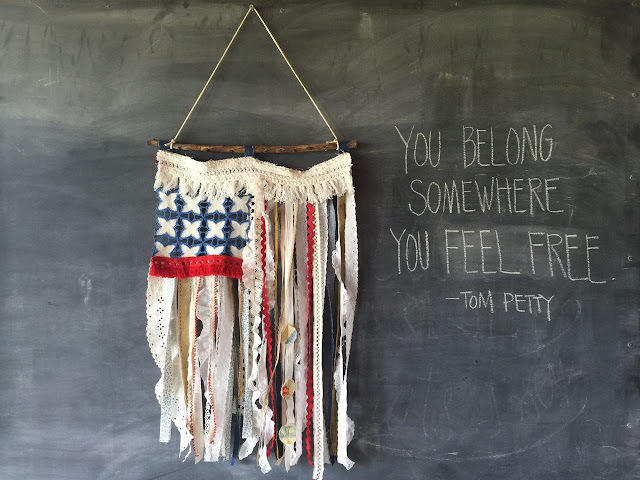 They'll ship out quickly so you can decorate for the 4th. Hope you enjoy. 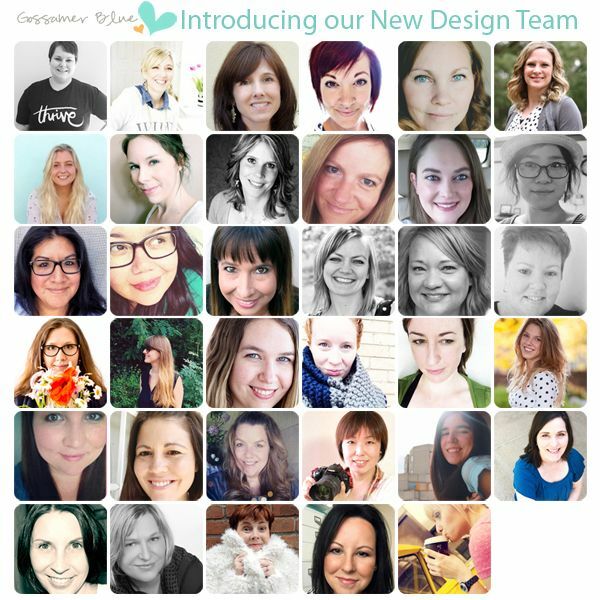 Welcome to my blog today....and please help me welcome the new Gossamer Blue Design Team. Please visit the site/blog for all the details. 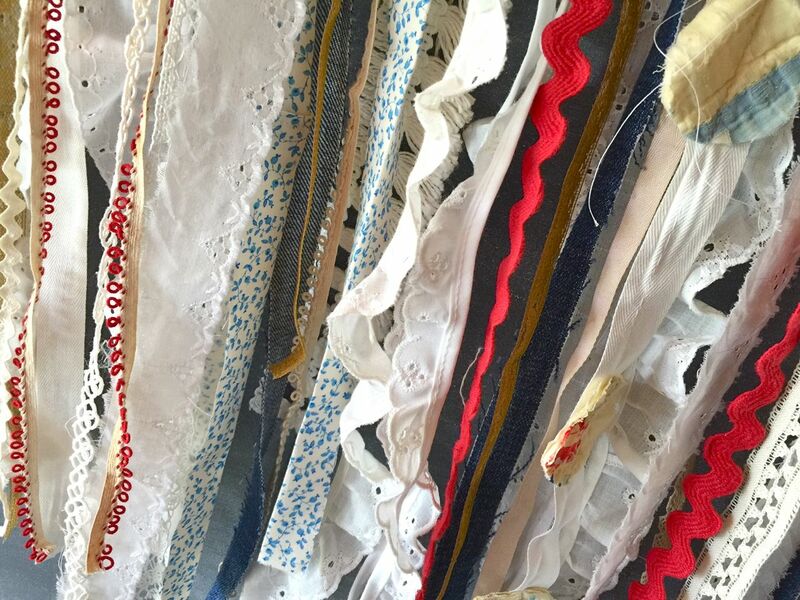 It's going to be a wildly creative new year at Gossamer Blue. Today we're kicking things off with a Design Team Inspiration Blog Hop. We're sharing projects created with the June Gossamer Blue Kits. 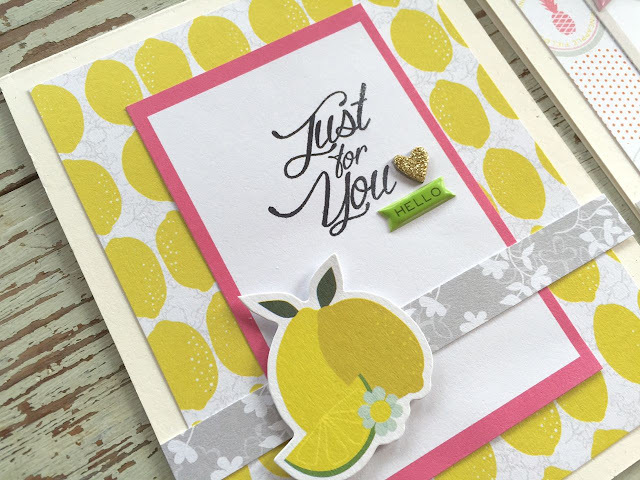 They are just full of juicy fruit goodness! 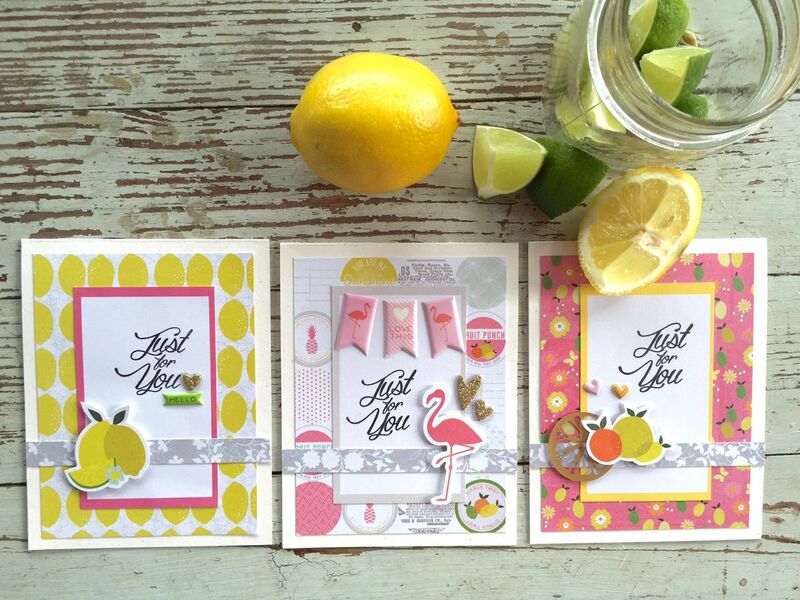 I created a trio of cards using the 6 x 6 paper pad from the Bits & Pieces Kit. All other items are from the GB kits, except the card bases and the "just for you" stamp. 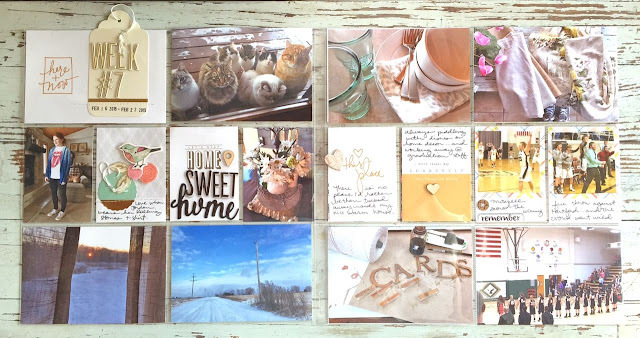 For each card I added some patterned paper to my base cardstock. I then trimmed down a square card from one of the kit packages. I stamped on my sentiment in black ink. 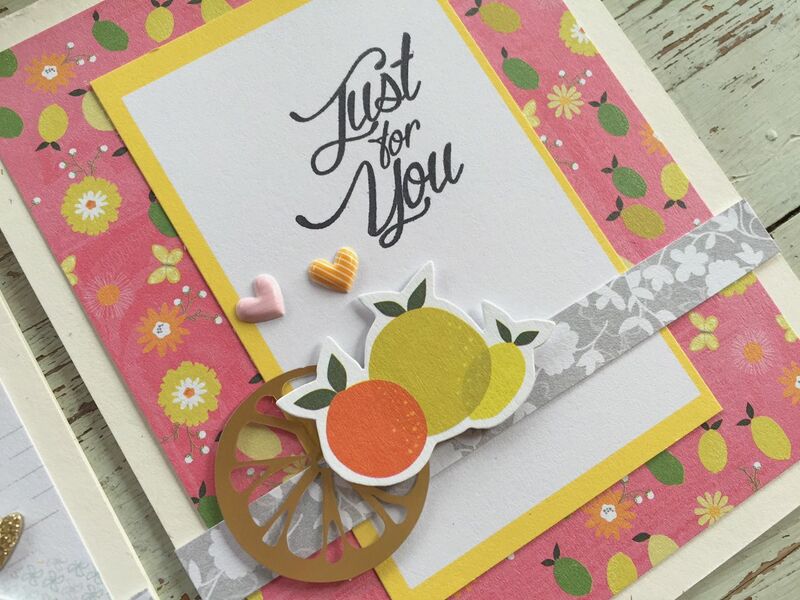 I chose a few embellishments for each card front, like puffy stickers, cardstock stickers and glittered hearts. 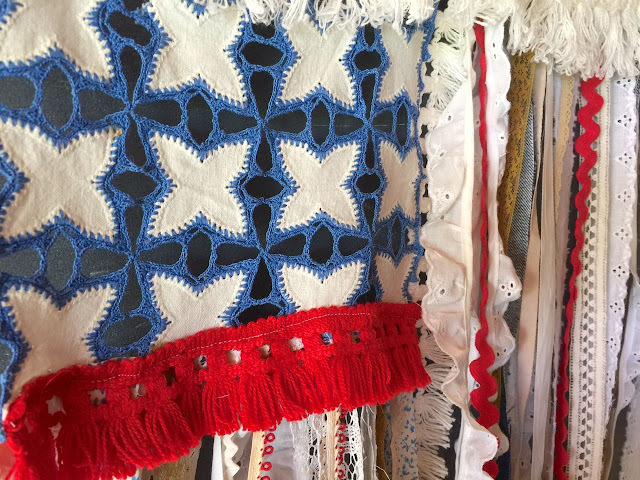 To ground my embellishments, I adhered a strip of the gray floral patterned paper under each grouping of elements. 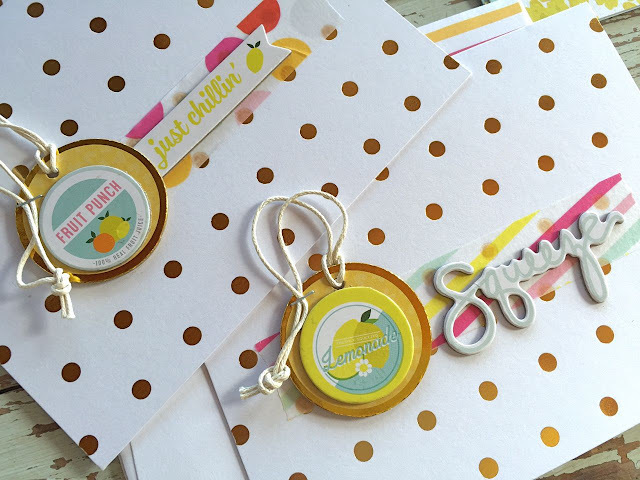 Simple, bright & cheery, perfect for any occasion and just the right colors for Summer. Hey all, I'm back and am happy to share a few projects I've been working on. 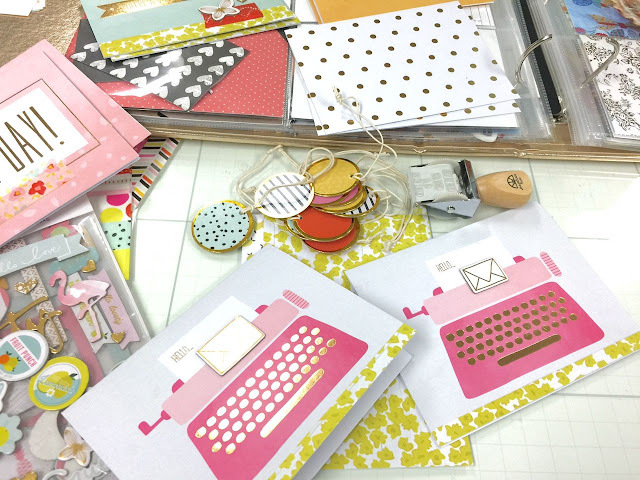 It was a fun month at Gossamer Blue! Today I'm sharing some sweet note cards I made using the June Gossamer Blue kits. The Bits & Pieces Kit (now sold out) came with an adorable set of note cards from Dear Lizzy. 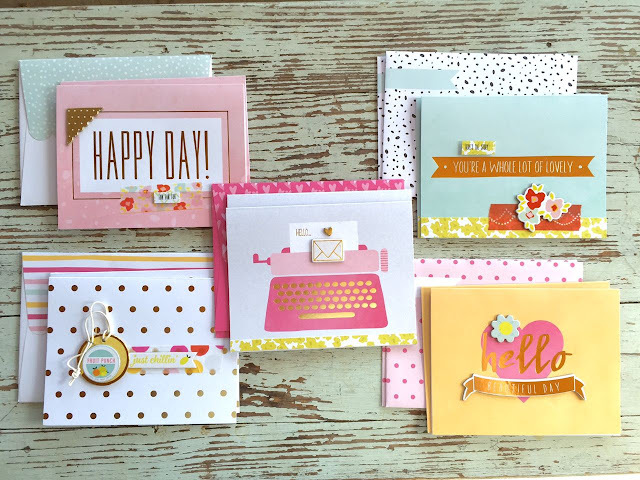 They were cute as they were but the kit also had some great coordinating chipboard stickers and a fun roller stamp from Amy Tangerine. I added some chipboard stickers to each note card (2 of each style) and also some stamped images from the roller stamp. For the patterned paper that I added to the bottom of some cards, I used the 6 x 6 Pink Paislee paper pad from the Bits & Pieces Kit. 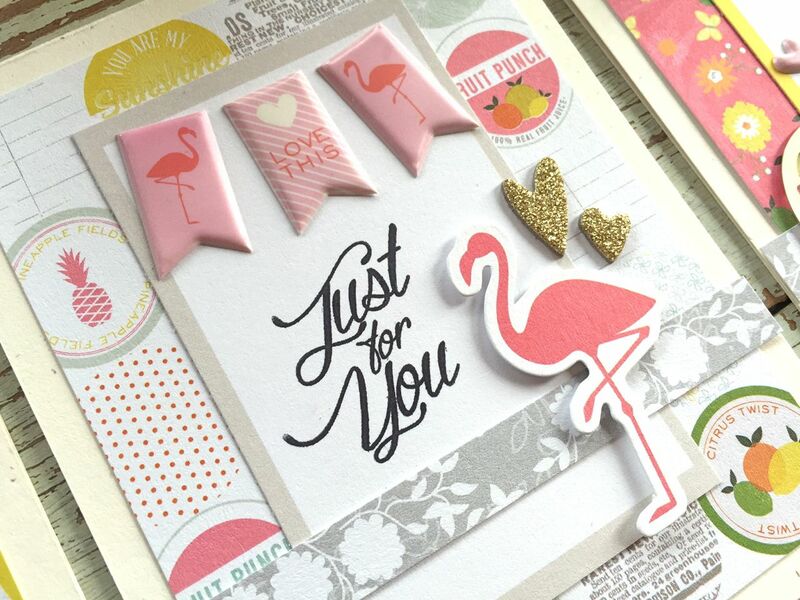 For these cards I added colorful tags from the June Life Pages Themed Add-on. 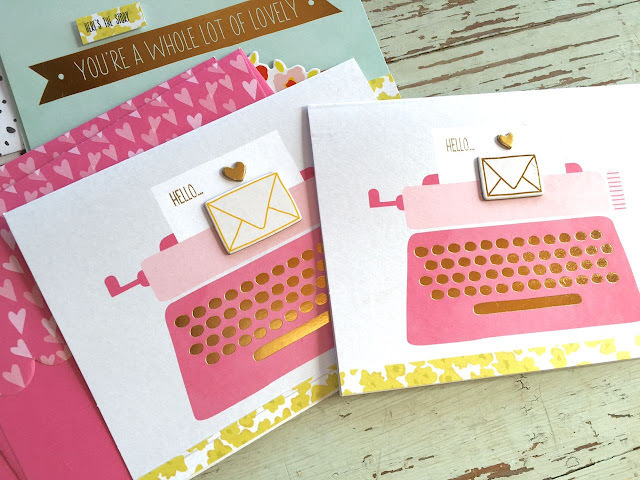 The gold foil on these cards is really cute and just makes the designs pop. I loved this month's kits so much. The products are so colorful and cheery. I'm off to make some more cards because I am plum out of thank you cards. I'll be back soon to share more. Thanks for stopping by today!